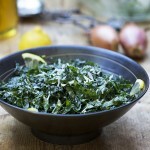 A delicious way to serve healthy raw kale! 1 large bunch Tuscan kale, washed, thick stems removed (about a pound) note: Tuscan Kale is the darker, less curly kale, also known as Dinosaur kale or Lacinato Kale. Slice the Kale: Stack about 1/3 of the kale leaves at a time into a pile and slice thinly into 1/4-inch shreds. Repeat with the rest of the kale. Transfer to a serving bowl. Make the Dressing and Toss the Salad: In a small bowl, combine shallot, lemon juice, honey, salt and pepper; whisk in oil in a slow stream. Pour dressing over kale and toss. Sprinkle parmesan on and and toss again.